In April, a video clip from 2005 was circulating in which Peter Brabeck-Letmathe, chairman of Nestlé, claimed that water should not be understood as a human right but a commodity with a market value like any other food. "Personally I believe it's better to give a foodstuff a value so that we're all aware that is has a price," he says, although Nestlé claims the remarks – which appear to support the idea of privatizing the world's water supply – have been taken out of context. Water right is a contentious issue, and the idea that a for-profit company can siphon water off the aquifer in drought-prone areas to bottle and sell is anathema to me and my Mom. My Dad and I often discuss how damming and diverting the Colorado River to serve the growing cities of the southwestern U.S. has reduced its flow to critical proportions. The graphic above, prepared by the U.S. Geological Survey, demonstrates dramatically why there is not enough water to go around. 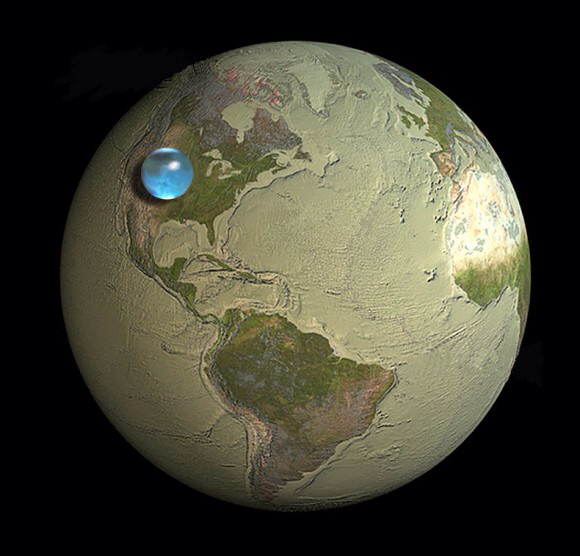 Although the planet is approximately 8,000 miles (12,500 km) in diameter, all the water on Earth would fit into a sphere 860 miles (1,385 km) wide. And that includes water in the oceans and the atmosphere. A sphere representing all of the liquid fresh water in groundwater, swamp water, rivers, and lakes Is a small proportion of that. And one that represents fresh water in all the world's lakes and rivers, the surface water that sources almost all of our daily needs, is so tiny as to be barely visible on the graphic.